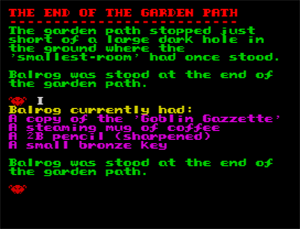 "With a copy of 'The Goblin Gazette' clutched tightly in one hand and a large, steaming mug of coffee in the other, Balrog waddled down the garden path in the direction of the little wooden hut at the bottom of the garden. 'I don't believe it,' thought Balrog, scratching his head in total disbelief and gazing into the abyss that was once the 'smallest-room'. 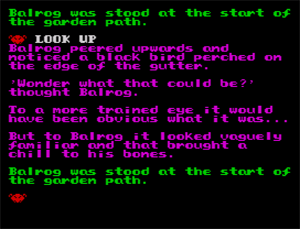 The 'smallest-room' was the place of solitude and contemplation that Balrog visited every morning without fail and the scene of numerous previous little adventures. It was now about to become part of a 'Where Is It?' of some monstrous proportions. 'What the heck has been going on here and where are the little rascals responsible for this damage?' thought Balrog. 'Them flipping rabbits must have been digging all last night'." 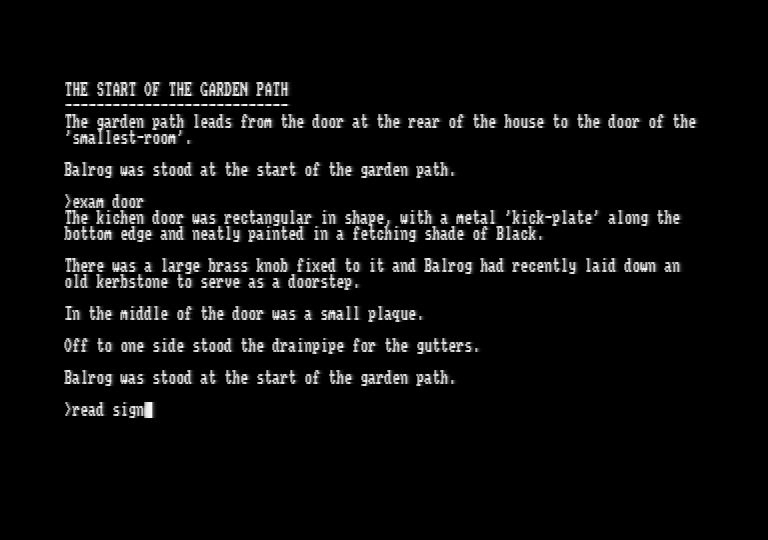 Behind Closed Doors Seven was written by Zenobi Software supremo and UK text adventure legend John Wilson. 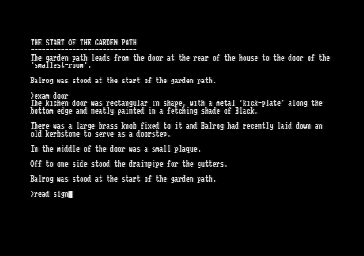 Originally produced using Adventuron, I again worrked with John on converting the game, using Gilsoft's PAWS, to work on retro systems such as the ZX Spectrum and Amstrad CPC. 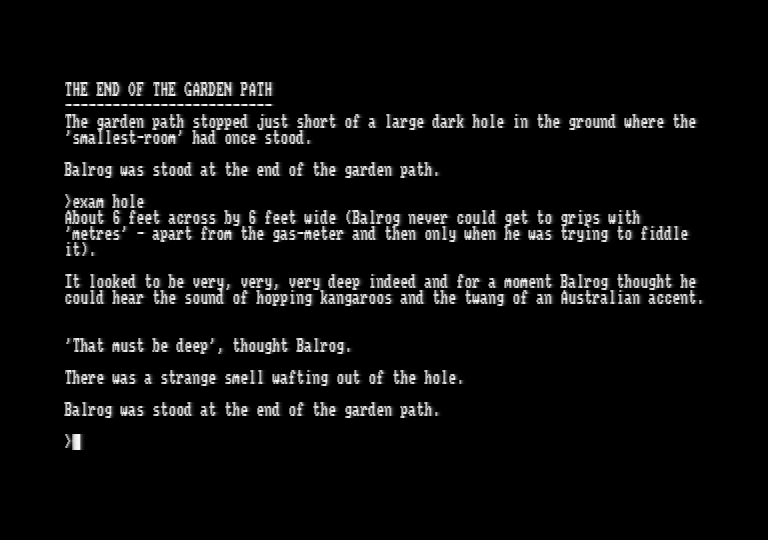 You can visit John's Zenobi Software site to learn more about the adventure. Mirrored & additional downloads are featured below. New for 2019! 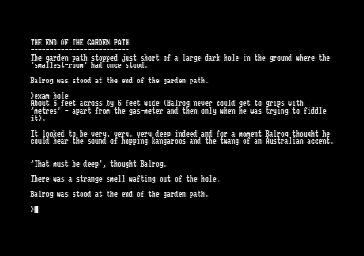 There is now a new DAAD-powered version of the game available for ZX Spectrum, Amstrad CPC, Commodore 64, Atari ST, and Amiga.